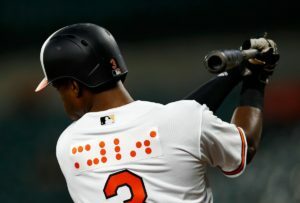 On September 18, 2018 the Baltimore Orioles became the first professional team to wear Braille lettered uniforms to recognize the National Federation of the Blind (NFB). The uniforms are being auctioned to benefit the NFB. Read more: https://www.si.com/mlb/2018/09/18/orioles-braille-uniforms.